We have cats available on the cats needing homes page. URGENT NEED FOR CONTRIBUTIONS OF ANY AMOUNT! Any amount you can contribute would be greatly appreciated!! Please send via paypal to: Chausie@ChausieRescue.com - or you can use our Fundrazr site: Contributions If you are interested in possibly adopting please fill out our adoption questionnaire. It does not mean you have to adopt - it is just the first step in case you would like to. Our Mission at Chausie Rescue is to place healthy, well socialized Chausie cats that are in need of a new home, into loving, nurturing environments where they can be part of the family. Our primary goal is to make sure no Chausie ever needs to go through the trauma of being placed in an animal shelter. About Chausies If you want a couch potato this breed is not for you! Common personality traits in the breed are their activity level, being thieves, loyal and bond tightly to their person - they can learn to open doors and cupboards and love to get into things - they are thought of as the "supervisor" as they want to be in the middle of whatever is going on, and they are curious and intelligent. They need stimulation and interaction and are even more striking in motion. They are not a breed that does well by themselves if a person is gone all day. 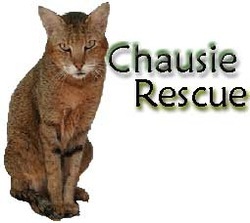 Organization Profile Chausie Rescue was founded to ensure any Chausie cat that ever needs a new home will be well cared for, medically checked and healthy while a forever home is located for them. Members of the Chausie Rescue are dedicated Chausie breeders and Chausie owners that love and respect this incredible breed of cats. Contact Us If we can assist you with finding your perfect cat, or if you have, or know of someone that has a Chausie that needs to be placed, please contact us. If you should ever see one in a shelter please contact us and we will immediately go to work and get the cat into one of our foster homes.